Work with your health care team to manage difficulty chewing. Otherwise, you may avoid certain foods or eat smaller portions. This can keep you from getting enough calories and nutrients. Mucositis, which is soreness, pain, or inflammation in the mouth. Xerostomia, commonly called dry mouth. Radiation therapy, chemotherapy, antidepressants, or pain medications can cause this. Gum disease, tooth decay, or tooth loss. These are possible long-term side effects of dry mouth, radiation therapy, or high-dose chemotherapy. Infections of the mouth after radiation therapy or chemotherapy. Pain and stiffness in the jaw muscles. This may be a long-term side effect of radiation therapy to the head and neck. Or it may result from jaw clenching or tooth grinding. Mouth pain. Some types of chemotherapy cause painful nerve damage. Tissue and bone loss in the jaw. This is a possible long-term side effect of radiation therapy. Physical changes to the mouth, jaw, or tongue from surgery. Not being able to wear dentures because of pain or swelling in the mouth or gums. Relieving side effects is an important part of cancer care and treatment. This is called palliative care or supportive care. Talk with your health care team about any symptoms you experience. This talk should include any new symptoms or changes in symptoms. Dental and oral health care. 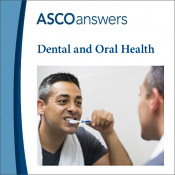 Dentists can help with oral care before, during, and after cancer treatment. Before starting cancer treatment, make sure you receive any procedures you need to treat existing dental problems. You should also ask about managing potential dental and oral side effects. For example, radiation therapy may increase risk of tooth decay or gum disease. A fluoride gel or mouth rinse can help prevent these problems. Speech therapy. Your doctor may refer you to a speech pathologist. This professional helps people use muscles in the mouth and throat. This includes chewing. Speech therapy is also helpful if surgery changes your mouth or tongue structure. Physical therapy. Physical therapy may involve massage, jaw exercises, and moist heat. Medication. Your doctor may prescribe medicine if you have pain while chewing. Some medicines reduce pain and inflammation. Others treat mouth or throat infections. Muscle relaxants treat jaw pain and stiffness. Surgery. Rarely, surgery may be recommended. Certain approaches may work better for some people than for others. Factors include the severity and cause of chewing problems. Try different types of foods and ways of eating. Find what works best. And remember to eat a nutritious diet. Your food should have enough calories, protein, vitamins, and minerals. Mash or blend foods. Add blended vegetables or ground meats to casseroles or soups. Try softer versions of your favorite fruits or vegetables. For example, applesauce, pureed carrots, bananas, or peas. Or consider eating baby food. Take sips of water or other liquids while eating. This keeps the mouth and food moist. Cut food into small bites, and chew slowly and thoroughly. Choose food high in calories and protein if you are losing weight. Such food includes eggs, milkshakes, casseroles, and nutritional shakes. Ask your doctor about meeting with a registered dietitian. This professional gives advice on eating a balanced diet.